In December, Ben brought home 4 boxes of empty jars from work. Each box had twelve tall jars. They were the perfect size for spice jars. And since I love everything to be uniform, I quickly turned them into my new spice containers. I soaked the jars in warm soapy water to easily remove the wrap and glue from around the sides of the jars. Then I took the lids outside and sprayed them with a brown spray paint. I did two coats to make sure everything was covered (though I did still miss some spots :/ ). Once dry, I used a clear-coat spray paint to seal the lids. 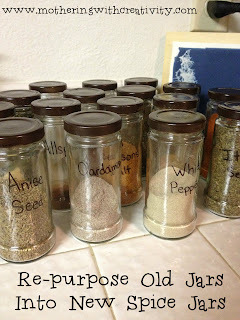 Once the paint was dry on the lids, I began to transfer all my different spices into these new containers. I just used a sharpie to label the jars. I LOVE looking into my nice and (mostly) orderly spice cabinet now! Since I already had the paints from another project, this project was totally free for me! The only thing, though, when re-purposing jars like this, is that there is no "shaker" option from the top. I don't mind, but if you prefer to be able to shake your spice jars directly, this may not be the best DIY project for you.